You can utterly smell the scent of the Samsung Droid Charge in the air signaling that its eventual launch is hopefully nearing, but you know that things are sure to move quickly when promotional materials starts to infiltrate Verizon Wireless locations. Even though there’s going to be plenty of face time available for the upcoming high end device, we find that there will be an available accessory that closely follows what's offered with the Motorola ATRIX 4G. 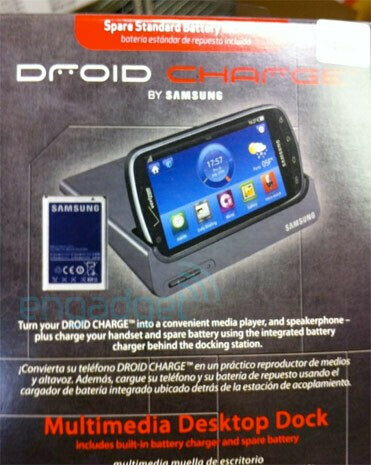 Planted straight with the Samsung Droid Charge in the leaked promotion material is nothing more than a Multimedia Desktop Dock. Similar to the one for the Motorola ATRIX 4G, the dock makes for a descent pedestal stand for the handset, but adding to its arsenal is the ability change a spare battery simultaneously. However, it’s not clear from the material whether or not the dock will be able to output video to an HD television, but as always, this is increasingly something that’s becoming standard for most high caliber smartphones on the market. The dock looks cheap, like something you would buy from China ebay for $9.99 Samsung should have taken a page out of Motorola's book. The Atrix HDMI dock is simply gorgeous! Oh, and will it ever be released?? 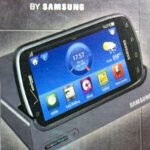 Remember the Samsung Galaxy S dock that was used in all of the promotion art. Where is it now Samsung????? That dock makes about as much sense as a single core phone in a dual core world. Your dual core world must also be 4D... it's in the future.